Birthplace of Samuel according to the present text of I Sam. i. 1, which, however, is corrupt. The usual interpretation, "Ramathaim of the Zophites," is an impossible one, since it would be contrary to Hebrew linguistic usage to regard "Zophim" as qualifying "Ramathaim." 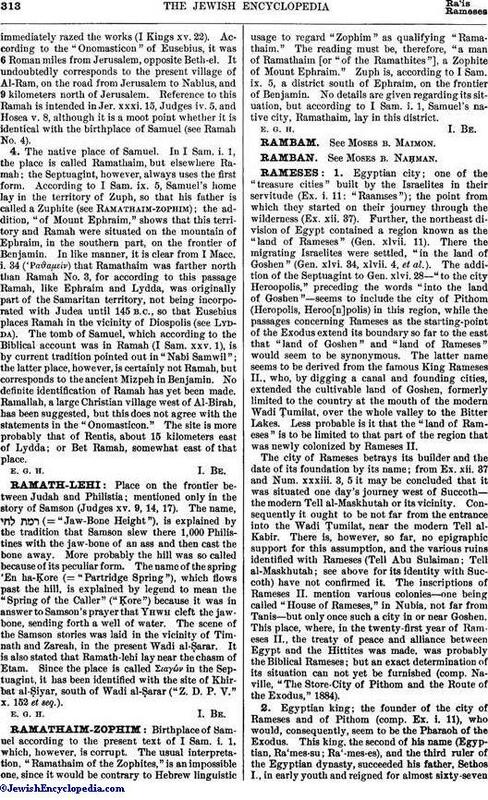 The reading must be, therefore, "a man of Ramathaim [or "of the Ramathites"], a Zophite of Mount Ephraim." Zuph is, according to I Sam. ix. 5, a district south of Ephraim, on the frontier of Benjamin. No details are given regarding its situation, but according to I Sam. i. 1, Samuel's native city, Ramathaim, lay in this district.